It all started when Christ The King Catholic Cathedral (CKC) of Catholic Diocese of Aba, according to handbill they shared to the public, the Church scheduled to hosts a prayer rally titled "Prayer For Peaceful Election" in Nigeria come 2019, it was scheduled on Thursday 1st November 2018 been Today. As the program commences with orderliness, the whole Church was filled with maltitude, some people were outside due to overcrowding. The Reverend father proceeded the service in tone with the program template, they start with preaching, he further advice the congregation to be wary of Nigeria politicians and be careful in dealing with them. Meanwhile, another Reverend Father was called upon to proceed the prayer session "Peaceful Election In Nigeria" as soon as the Reverend father said to the crowd let's Pray for peaceful election in Nigeria, many thunderous voices was heard around all corners of the Church, saying "there will be no election in Biafra land till Referendum is conducted" in few seconds Biafran flag, Isreali flag, and US flag were raised high in all corners of the Church. At this point in time, the whole Church was seen with flags, while singing "Holy! Holy! 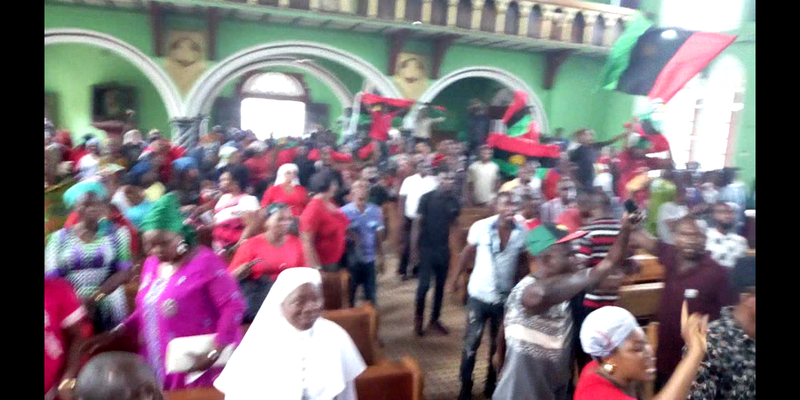 Nnamdi Kanu Is Another Saviour" members of the Church has no other option than to join the crowd in singing the song, other members were seen overwhelmed with joy hailing IPOB members, while other Church members were covering the event with their phones and Cameras. Some Reverend fathers and sisters were also capturing the program with their phones, murmuring "who are these people? I have never come across such people with so much zeal towards the quest for Biafra restoration ". 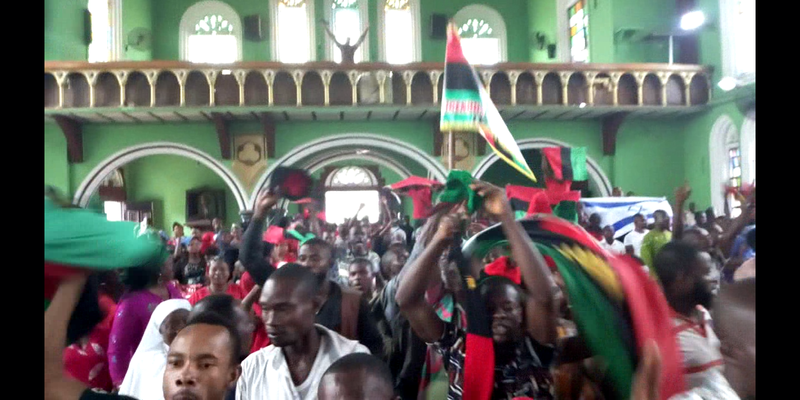 As the atmosphere of the Church environment keeps on raising, an order was given by IPOB leadership, every one of IPOB member heed to the order and dispatch to their various houses. Biafrans are using this medium to send warning to all these priests masquerading as God's messenger to desist from conducting evil prayer for the continuation of the existence of this British murderous establishment called Nigeria , we also want to use this podium to sound a note of warning to all Nigerian politicians to stay away from doing their campaigns in Biafra land or else they will be disgrace to the core, a word is enough for the wise. IPOB stand on no election in Biafra land is none negotiable until a date of the referendum is assured, without that any other option is dead on arrival. Published By Nwaiwu For Umuchiukwu Writers .